Everything in my garden has suddenly gone whoosh! 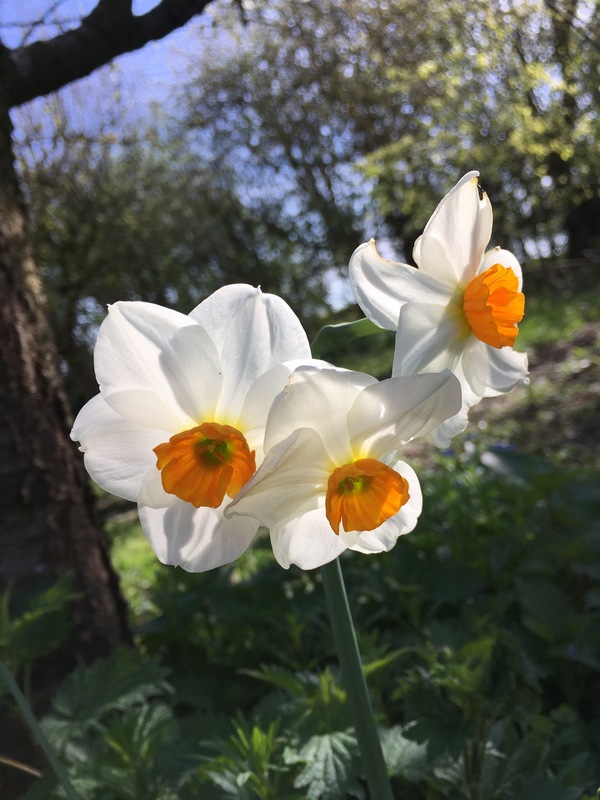 I’m running round the plot at breakfast, lunch and tea break – finding flowers that I’m certain were not there earlier in the day. Plants just seem to pop up overnight. 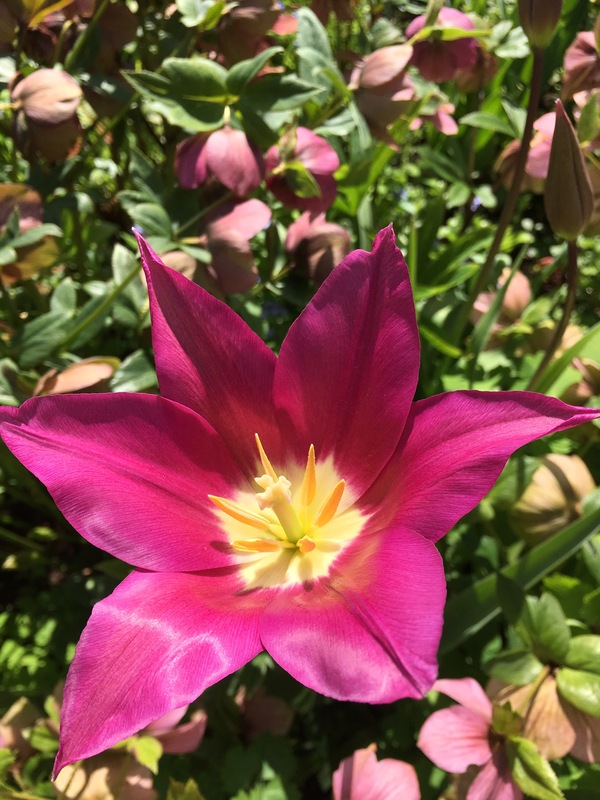 My favourite tulip, Burgundy, was only in bud for a day or two. Then by lunchtime, the flower was wide open. When the wind blows, they look like ribbons of silk scarves, dancing in the breeze. Lily-flower tulips have a certain elegance and movement. Much better than their stiff, cottage cousins, I think. Hellebores make perfect ground cover in fading shades of purple and pink. As a contrast there’s tiny forget-me-nots in the borders, and the lawn is edged with a frill of scented wild violets. Blue and cerise pink make very happy companions. 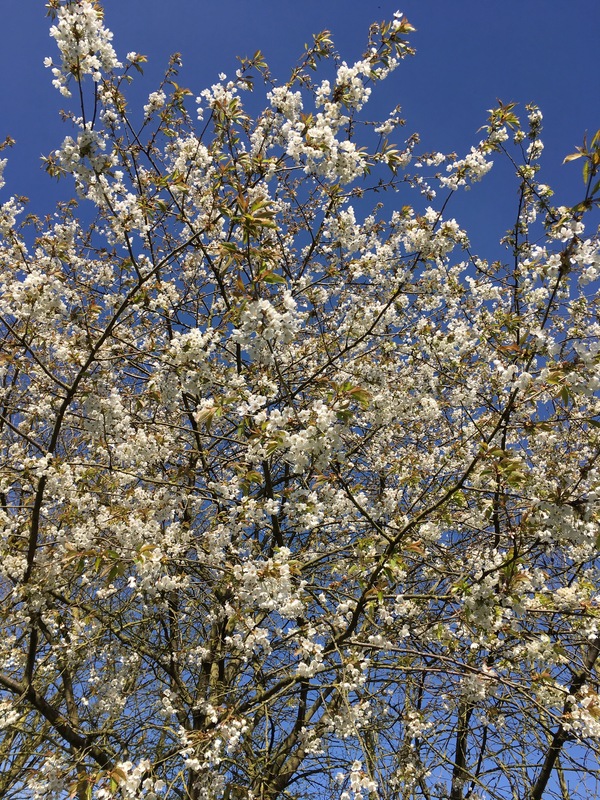 Looking up, banks of cherries make a white cloud over the wild garden. There will be lots of fruit for the blackbirds- and us. Hasn’t it been a fabulous year for blossom. Cold temperatures in January, followed by sunny, mild days in March, mean we’ve had the best year for cherries and magnolias for a long time. 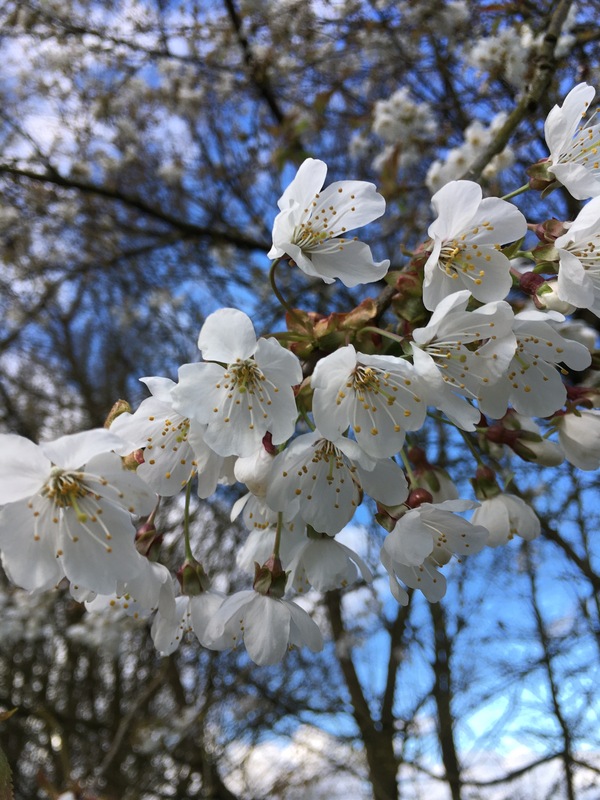 My planting is the wild cherry Prunus Avium. Simply beautiful- all year round. If we don’t have any frost, there will be a record plum harvest. There’s enough to pick for the house too. Blossom on the breakfast table and by my bedside. One of the joys of spring. 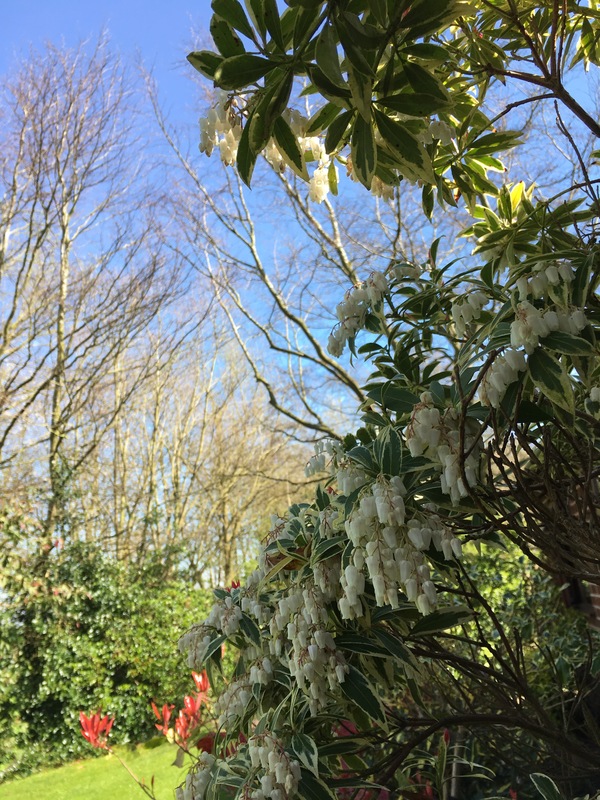 Pieris Flaming Silver is planted in an enormous pot. It wouldn’t like my heavy clay soil, so I cheat with containers and ericaceous compost. It’s beautiful all year round with white heather, bell-like flowers and red new growth. 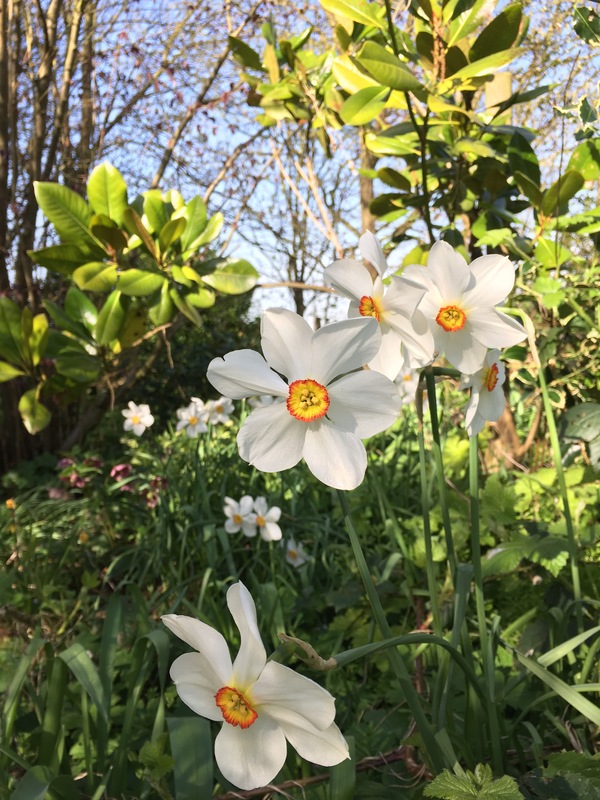 My favourite narcissi is white Pheasant’s Eye. Reliably comes back every year, and naturalises in borders and under trees. White, highly-scented Narcissi Geranium is another glorious treat. My children used to call it the poached egg flower. Brightening up a dark corner- Devon Red. The petals look sugar-coated in sunshine. A hardy flower which copes with hail and high winds in my garden. Narcissus Ice Follies, viewed from the summerhouse, replace the snowdrops and wild anemones. 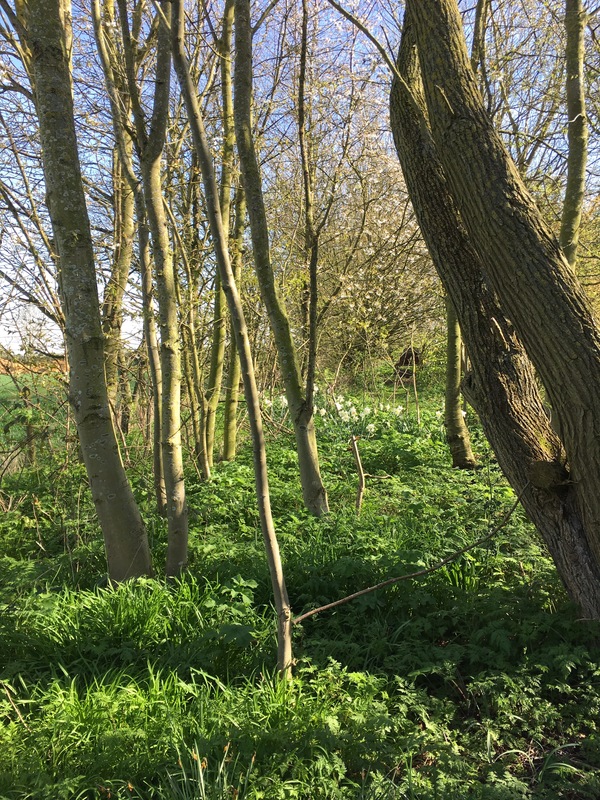 Cowparsley will soon compete with native bluebells. It’s an ever changing scene. 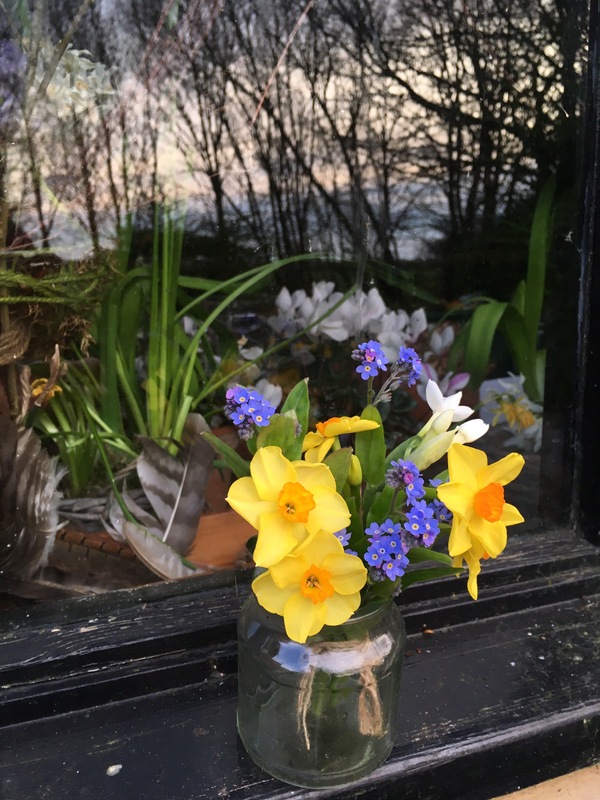 I love these cheerful jonquils on the potting shed windowsill. A perfect match for forget-me-nots, and just the right size for jam jar flowers. Trees by the pond show a reflection in the window. And the last of the paperwhites, hyacinths and cyclemen are pressing at the glass. And I’ve got company again! 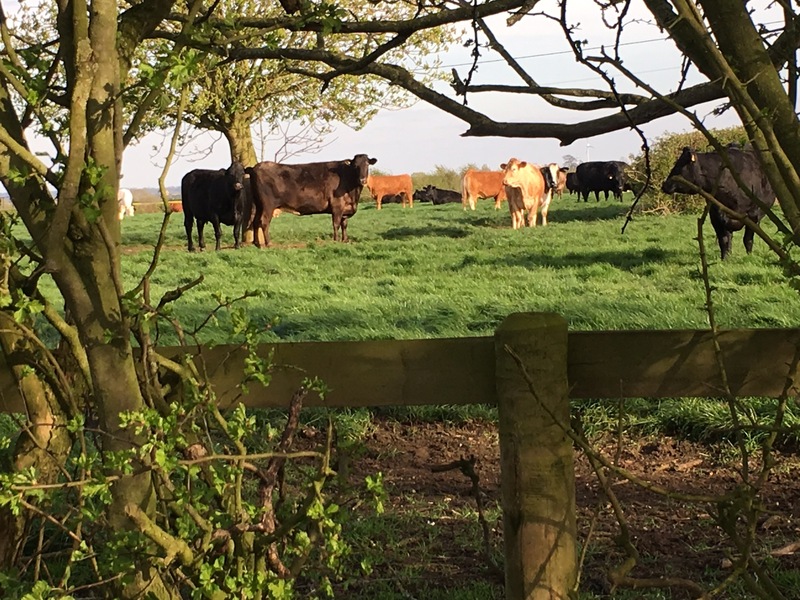 Opposite the garden gate are these beauties, let out onto grass for the first time this year. They look on incredulous as I dig and weed. What sights do you love to see in your garden in April? Do get in touch and let me know. Thanks to Helen for hosting this end of the month view. Click on the highlighted words for more information. They are not advertising or affiliate links. All are beautiful, but oh, that Burgundy tulip! Divine! Beautiful !!!! You are so blessed !!! I agree, your tulip is beautiful! Your blossom is wonderful, doesn’t it look stunning against such a blue sky. My Pieris seems happy enough on my heavy clay soil, you have a lot more flowers though! I like the lily-flowered the best too. 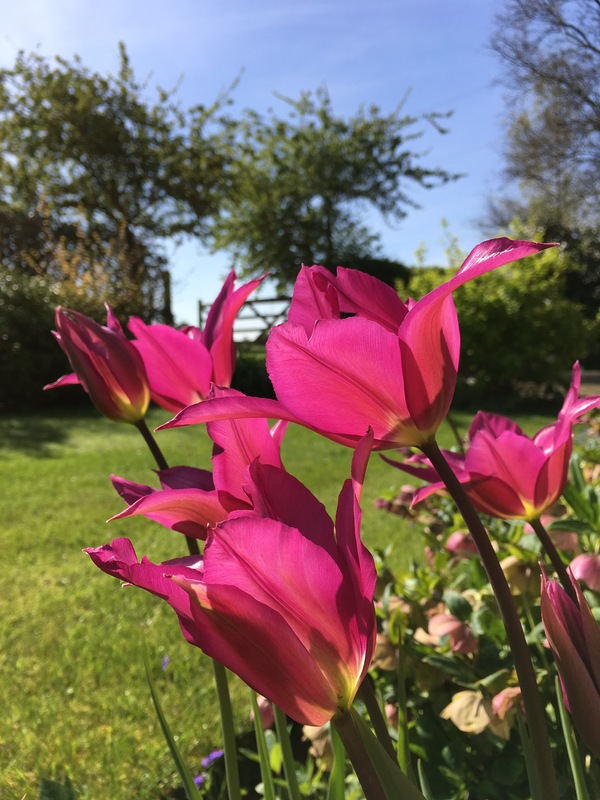 My tulip flowers – especially those planted last autumn – are all very small this year. I’m wondering if our exceptionally cold winter is responsible. 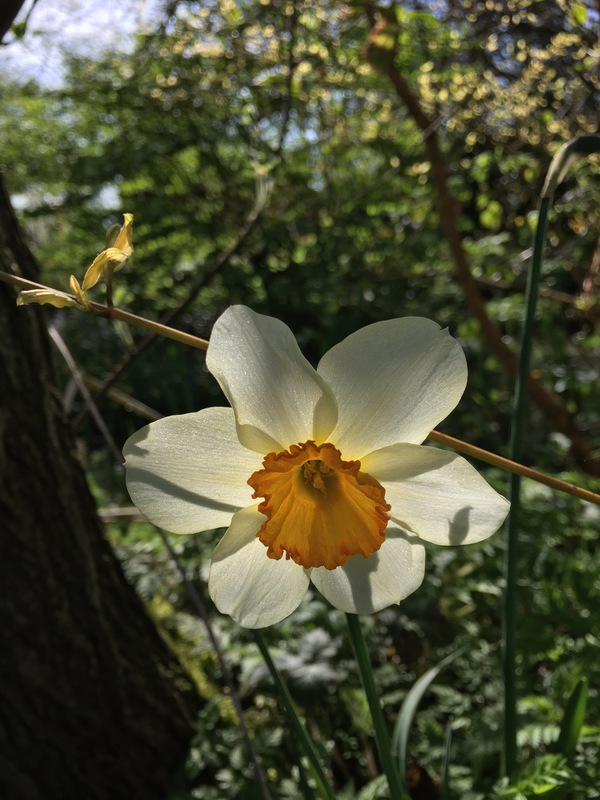 What wonderful narcissus and blossom pictures! Thanks. I had a theory that it was to do with the ground being frozen for almost two months after they were planted. All the bulbs already in the ground were just fine, normal size. The spring blossom does seem to have been exceptional this year. I do envy you for the wood an arboretum is on my wish list. What a beautiful garden! 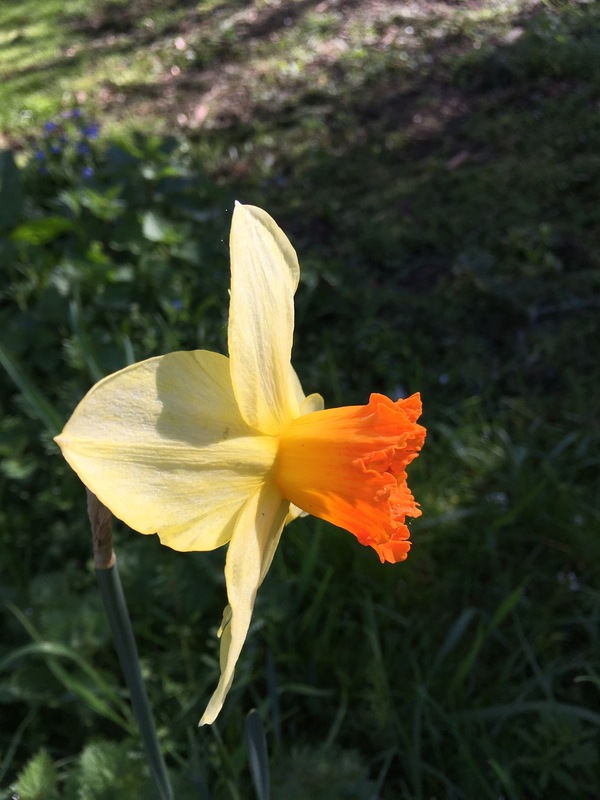 So nice to see that we have the same flowers in our gardens at this time of the year! Just lovely, Karen, your garden look beautiful. Don’t we all need more mulch! I know what you mean, my little garden seems to be on steroids and every time i race home from work it has changed completely again! Great photos! Whoosh is a good word for it! Pieris does alright for me in heavy clay soil too. It’s borderline acid, probably about 6.5. The spring blossom is very beautiful this year. Here I’m sure it is because the winter was colder than usual. Many plants are flowering earlier too. A wonderful scene you’ve shared Karen. 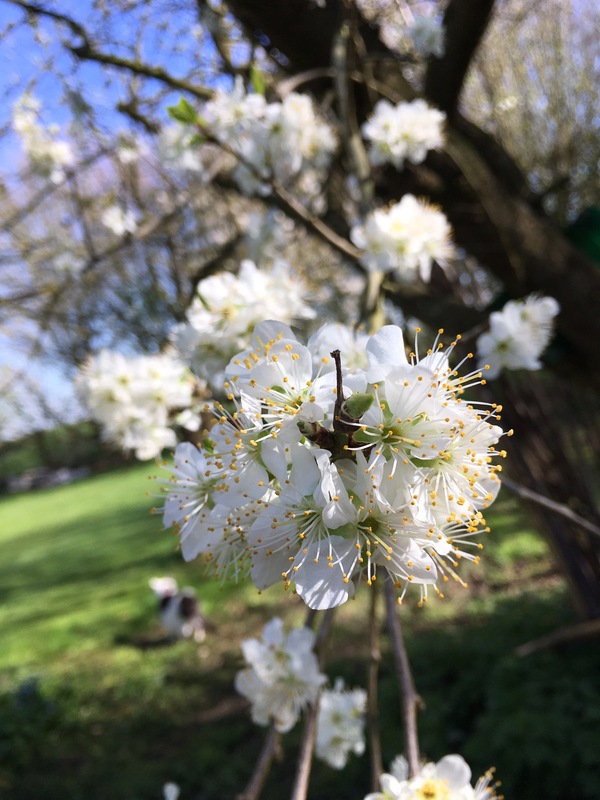 The Victoria plum blossom has turned already here and the apple blossom is about to pop. I am a little nervous as night time is still very cold and next week looks to be a return to seasonal norm. Super photos Karen, You have a lovely garden and I can see it brings you great joy. Thanks for sharing your joy. Thank you so much Denzil. Thanks for taking the time to read and get in touch. It’s much appreciated. Your flowers and tree blossoms are a good month ahead of ours. We don’t see that until May, when our tulip festival gets underway.